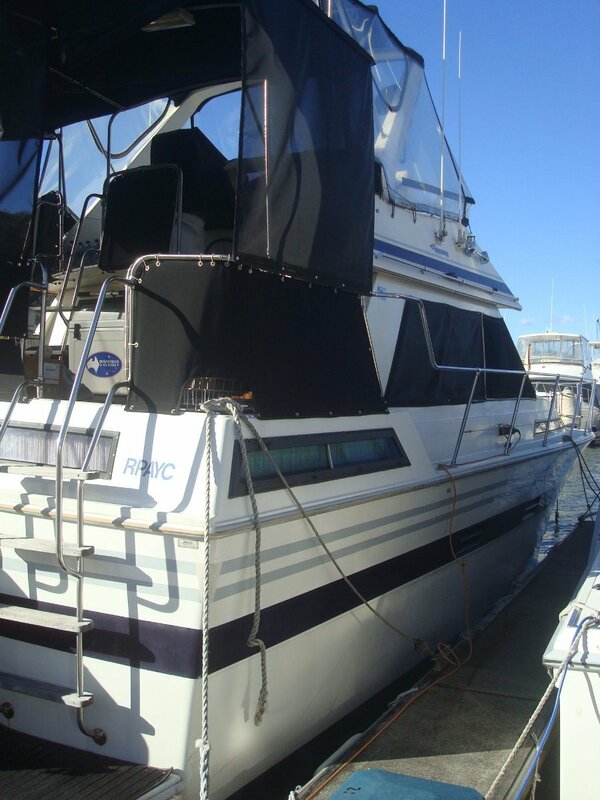 Rare two Cabin, large volume family cruiser. Ranger 35 Sundeck with two cabins, two bathrooms and large saloon has more interior space than any other boat in this size and price range. "Therapy" is a 1989 model powered by twin Cummins 250HP BT series diesel engines with shaft drives. Cruising speed 18-20 knots. Engine hours 1400 hrs at time of listing. Slipped in June 2017 for antifouling and prop speed re-allocation plus all new anodes fitted. An ONAN 6kW Generator, and 12V/240V inverter supplies power off shore. 2 x 500 litre diesel tanks, 500 litre fresh water tank allows for long range cruising. 2 station control hydraulic trim tabs. A double master cabin with en-suite bathroom includes electric toilet, vanity and shower recess. Cabin also has wardrobe and storage draws. Forward cabin has 2 bunks almost full beam at the entrance and can be converted to a double bed with an in-fill. Draws and storage located under bunks. 2nd Bathroom with electric toilet, basin and shower located adjacent to cabin. The dinette table which seats six comfortably can be lowered and turned into a double bed. All windows have sun protection. Kitchen has double bowl SS sink, 2 x 240V hotplates, Refrigerator, Convection Microwave, Freezer, Pantry and tons of storage space. Saloon is fitted out with TV/DVD, DVD player, Cassette player, Surround Sound system, AM/FM/DVD Radio and is air conditioned. Back deck is covered with roll up sunscreens and has extended seating creating large deck area that is not common to other Ranger's. A SS gas barbecue, Ice maker, 75 Litre/7 day ice box and collapsible table sets up the back deck. A 3 station anchor winch control is fitted and deck wash facility. The flybridge/rear deck layout is very liveable and the short distance between flybridge and rear deck means that the captain is in close contact with family and friends at all times. Swim shower on swim platform, trim tabs, 4 fender baskets, all decks fitted with carpet. Inflatable dingy with a 5HP Mercury outboard sets the boat up for family fun. Sleeps 2 in double, 2 in V Berths 2 in converted Dining area. 240V. Fan Forced Convection Microwave Oven.